St Patrick, the Apostle of the Irish, was seized from his native Britain by Irish marauders when he was sixteen years old. Though born the son of a deacon and grandson of a priest about 373 AD, it was not until his captivity that he sought out the Lord with his whole heart. In his Confession, the testament he wrote towards the end of his life, he says, "After I came to Ireland - every day I had to tend sheep and many times a day I prayed, the love of God and His fear came to me more and more, and my faith was strengthened. And my spirit was so moved that in a single day I would say as many as a hundred prayers, and almost as many at night, and this even when I was staying in the woods and on the mountain. And I would rise for prayer before daylight, through snow, through frost, through rain, and I felt no harm". After six years of slavery, he was guided by God to make his escape from Ireland, and afterwards struggled in the monastic life at Auxerre in Gaul, under the guidance of the holy Bishop Germanus. Many years later he was ordained Bishop and sent back to Ireland around 432 AD, to convert the Irish to Christ. His arduous labours bore so much fruit that within seven years, three Bishops were sent from Gaul to help him shepherd his flock, "My brethren and sons whom I have baptised in the Lord - so many thousands of people", he says in his Confession. His apostolic work was not accomplished without much "weariness and painfulness", long journeys through difficult country, and many perils; he says his very life was in danger twelve times. When he came to Ireland as its enlightener, it was a pagan country, and when he ended his earthly life around 461 AD, some thirty years later, the Faith of Christ was established in every corner of Ireland. 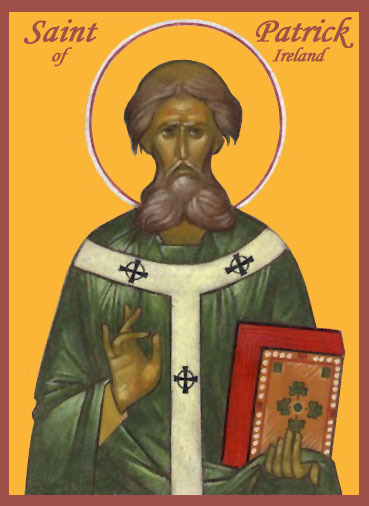 O Holy Hierarch, equal of the Apostles, Saint Patrick, wonderworker and enlightener of Ireland: Intercede with the merciful God that He grant unto our souls forgiveness of offences. The Master revealed you as a skilful fisher of men; and casting forth nets of Gospel preaching, you hauled up the heathen to piety. Those who were the children of idolatrous darkness you rendered sons of day through holy Baptism. O Patrick, intercede for us who honour your memory.